Athens is a unique city in my eyes, not just because I was born and raised here. Widely known for its ancient monuments, Athens combines its historical aspects with its modern ones. 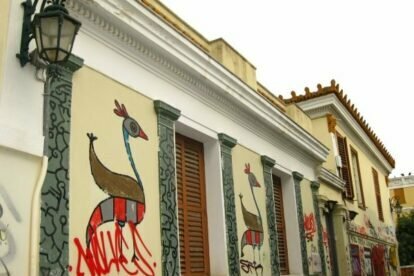 An example of this harmonic co-existence of old and new, classical and modern are some houses in Plaka: located in the oldest Athenian neighborhood and built probably a century ago, they have transformed their walls to a street gallery of beautiful graffiti. Not only in Plaka though, but all around the center, smaller or bigger graffiti and stencils decorate the grey city walls. Some of them simple but some other truly artistic, they make me smile especially when I find them in the most weird places. Keep your eyes open!